Henrietta Laura Pulteney inherited the vast Pulteney estates in 1782. With her father, she created the elegant new town at Bathwick including Great Pulteney Street and Sydney Gardens, where the Holburne Museum now stands. 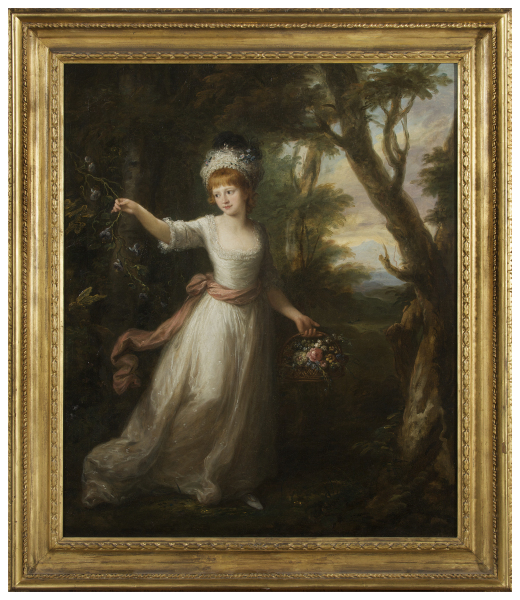 The Swiss-born artist Angelica Kauffman has shown the child Laura plucking flowers in a wood, dressed in white. The artist’s almost miniaturist eye for detail reveals the luxury of the heiress’s outfit: a fragile embroidered gown, silk sash and cap decorated with lace, frills and feathers. Henrietta Laura Pulteney (1766-1808), known as 'the richest spinster in Europe', inherited the vast Pulteney estates from her mother in 1782. With her father William Johnstone, she created the elegant new town at Bathwick, extending from the Pulteney Bridge through Laura Place to Sydney Gardens, where the Holburne Museum stands. Laura was the sole heir to the family fortune and played an active part in its management. She was created Baroness Bath in 1792 and Countess of Bath in 1805. 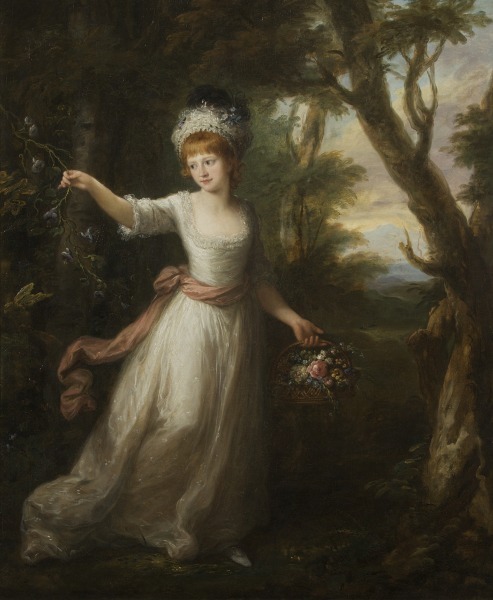 In her youth she was described as an 'indefatigable dancer' and this carefree spirit is captured in the Swiss artist Angelica Kauffman's portrait of the eleven year old Henrietta. Kauffman used a small-scale format for full-length portrait, suitable to her delicate style that enjoyed the patronage of the highest social circles. Laura's white muslin frock, cap and simply fringed hair look at first glance identical to those worn by her middle-class contemporaries. But Kauffman's almost miniaturist eye for detail reveals the luxury of her dress: the overdress is a fragile embroidered gauze, the sash has a deep silk fringe, while the cap is an extravagant confection of lace, crimped frills and feathers. Purchased in 1996 with the aid of grants from the MLA/V&A Purchase Grant Fund, the Heritage Lottery Fund and the National Art Collections Fund.